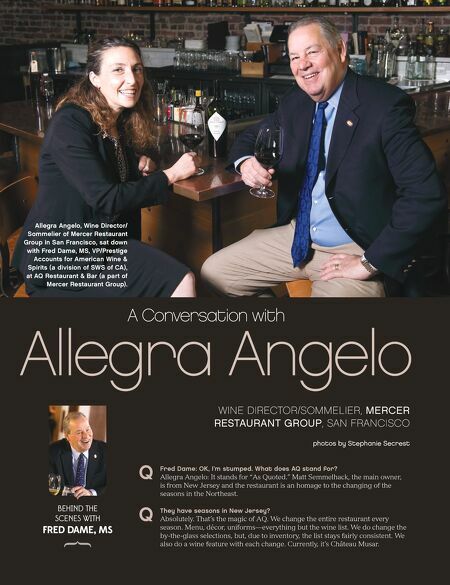 WINE DIRECTOR/SOMMELIER, MERCER RESTAURANT GROUP, SAN FRANCISCO photos by Stephanie Secrest Allegra Angelo A Conversation with BEHIND THE SCENES WITH FRED DAME, MS Allegra Angelo, Wine Director/ Sommelier of Mercer Restaurant Group in San Francisco, sat down with Fred Dame, MS, VP/Prestige Accounts for American Wine & Spirits (a division of SWS of CA), at AQ Restaurant & Bar (a part of Mercer Restaurant Group). Fred Dame: OK, I'm stumped. What does AQ stand for? Allegra Angelo: It stands for "As Quoted." Matt Semmelhack, the main owner, is from New Jersey and the restaurant is an homage to the changing of the seasons in the Northeast. They have seasons in New Jersey? Absolutely. That's the magic of AQ. We change the entire restaurant every season. Menu, décor, uniforms—everything but the wine list. We do change the by-the-glass selections, but, due to inventory, the list stays fairly consistent. 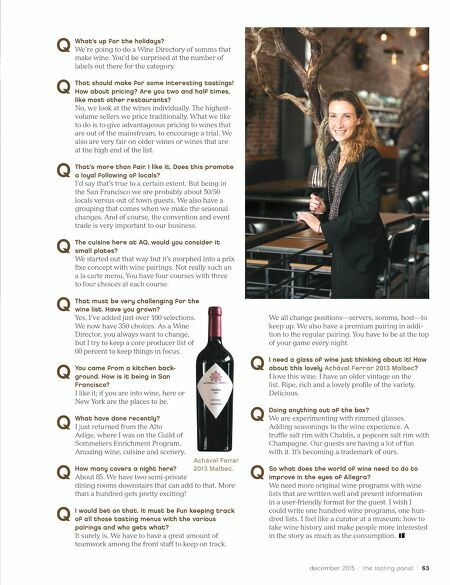 We also do a wine feature with each change. Currently, it's Château Musar.